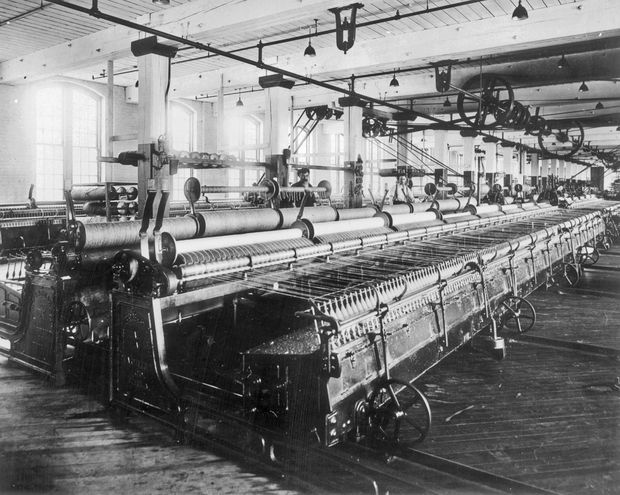 Toronto Carpet Co. – in approximately 1905 – making cloth on looms. Vincent Bérubé is a partner at McKinsey & Co. John Kelleher is a partner at McKinsey & Co. and co-chair of NEXT Canada. Tiff Macklem is Dean of Rotman School of Management at the University of Toronto. Ajay Agrawal is the Geoffrey Taber Chair in Entrepreneurship and Innovation and founder of the Creative Destruction Lab at the Rotman School and co-author of Prediction Machines: The Simple Economics of Artificial Intelligence. So stated Nobel laureate and MIT economics professor Robert Solow in 1987. Eventually, economists found where the productivity gains from the computer age were hiding: in the future. As we know, they finally showed up. But they took longer than expected because they depended on investments in complements. As in the computer age, the widespread productivity gains associated with artificial intelligence will depend on investments in complements, which are all the things other than algorithms and models needed to make commercial-grade AI work. These include data, redesigned workflows, training, regulation, human judgment, infrastructure and more. Paul David, a Stanford economist, responded to Prof. Solow’s productivity paradox remark by examining the history of electrification after 1900. Mr. David’s key insight was that the productivity gains took a surprisingly long time after the initial invention – more than two decades – due to the many other complementary investments required to fully realize electricity’s benefits. For example, distributed electricity allowed for powered machinery to be spread out rather than stacked to enhance material handling and workflow, but to do this required factory layouts to be entirely redesigned as single-storey rather than multistorey. And electric-powered machinery could be made more modular so that downtime for one machine did not require downtime for all, but that also required redesign. As we shift from technical achievements in AI (“Look everyone – the AI can read the address on an envelope! The AI can classify a medical image! The AI can play a video game!”) to large-scale commercial deployment, the design and implementation of complements will be paramount. In other words, we are entering the next phase of the AI revolution: competition in the market for AI complements. This will feel different from what we’ve experienced so far. While technology advances will continue, the genteel competition among computer scientists on display at conferences such as the Conference on Neural Information Processing Systems that is based on the performance of new AI algorithms against well-specified technical benchmarks such as ImageNet will give way to fierce competition among firms over the ownership and control of scarce complements, such as data, infrastructure, talent and relationships. For companies, competition in the semi-scientific culture of algorithmic performance against benchmarks was curious and novel. However, competition over complements is familiar territory. And given the size of the prize - research by McKinsey estimates that artificial intelligence will deliver nearly US$13-trillion (over CAD$17 trillion) of economic impact worldwide by 2030 – this competition is likely to get rough and tumble as corporate AI strategies depend at least as much on complements as algorithms. Firms across all industries are beginning to craft their AI strategies and allocate their budgets accordingly. Strategies involve identifying the most valuable use cases, investment in research and development, AI talent attraction and retention plans, work-force education and retraining programs and more. How well prepared are we in Canada to compete? A McKinsey survey earlier this year showed that while 89 per cent of Canadian executives believe AI will create substantial value for their businesses in the near term, only 34 per cent have penned an AI strategy. Furthermore, the research and development efforts of Canadian companies continue to sit at half that of the United States in many sectors. In software services, for example, Canadian companies spend 66 per cent less on R&D than their U.S. counterparts. Moreover, Canada’s ratio of AI-related patents to research papers over the past 25 years is 10 times lower than that of the United States. And while international tech giants such as Google, Facebook and Microsoft are wisely setting up R&D labs in Canada to tap our deep AI talent pool, equivalent Canadian tech giants are hard to find. But it’s not too late. While research shows first movers are likely to capture a disproportionate share of AI’s value, we are still in the early days of commercial grade AI adoption. Only about 20 per cent of businesses have embedded AI into more than one business unit or function. Intensified competition will increase the pressure on companies to deliver results. In addition, competition will intensify at the policy level. Over the past year, one country after another announced their national AI strategy - and most of them read more like industrial than science policy. Competition over complements is about to become fierce. On Oct. 23, 2018, the Creative Destruction Lab will host its fourth annual conference on the business of AI – Machine Learning and the Market for Intelligence. The theme this year is AI complements.